"I want to send PDF documents through email but find that the size is too large. Is there any way for me to compress the PDF file size?" Yes there is! Here are 10 tips to help you compress PDF on Mac for email or other sharing purposes. In fact, there any many ways to reduce a PDF file size, such as remove unwanted objects, shrink images, convert or compress a PDF. 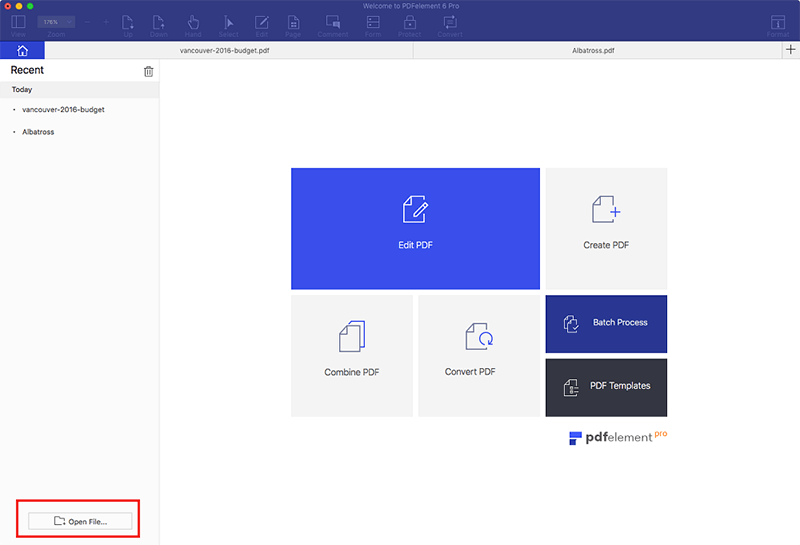 No matter which method you choose, you can learn how to compress PDF without losing quality with PDFelement ProPDFelement Pro by reading the content below. 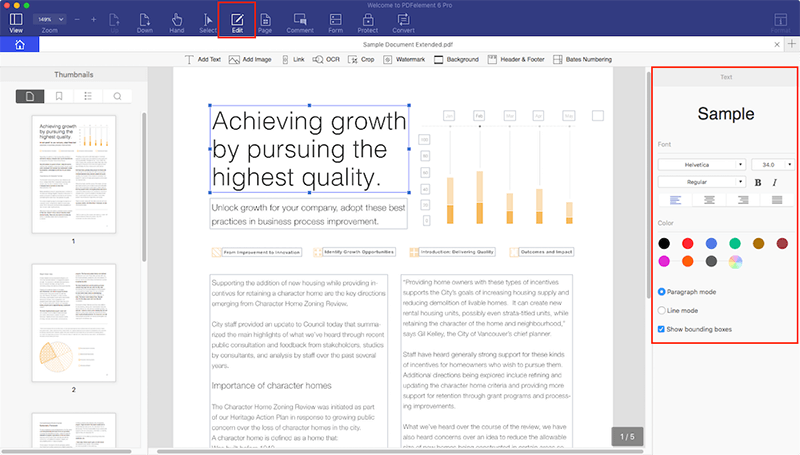 Edit PDF text, images, links, and annotations with built-in editing tools. Create or convert PDF to or from other formats like Word, Excel, Webpages, etc. Combine multiple PDF files and split a large PDF file into several files. Fill out PDF forms and create fillable PDF forms from form templates. Secure PDF documents with a password and decrypt protected PDFs easily. 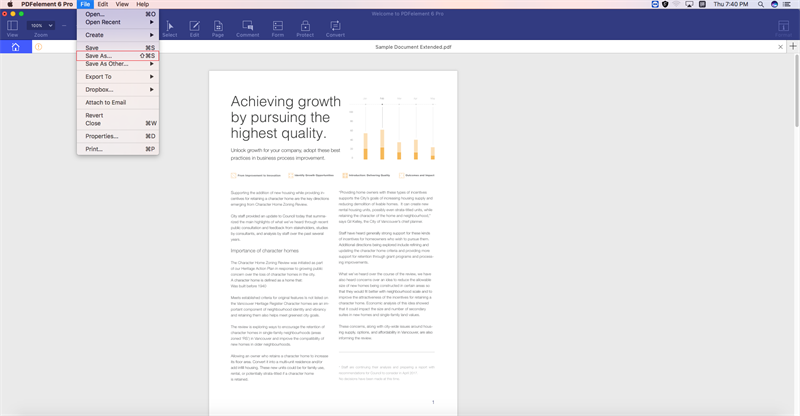 Perform OCR to edit and convert scanned PDFs without any fuss. 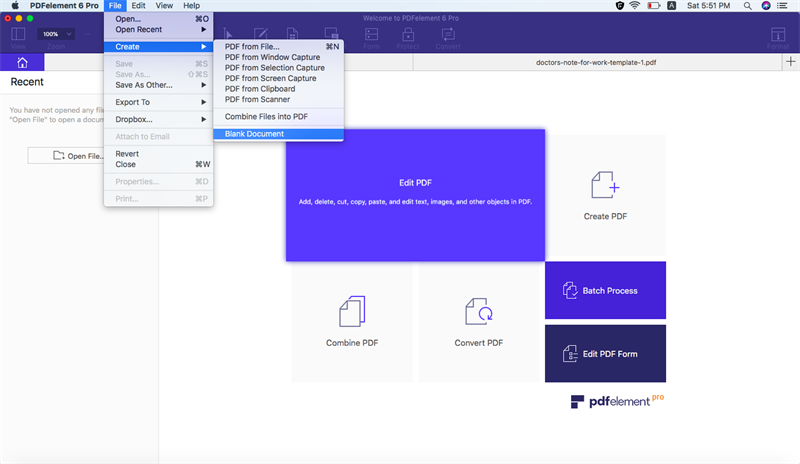 Launch this PDF Compressor for Mac. Click the "Open File" button to add your file. Alternatively, you can also drag and drop the PDF you want to compress into the program window. The file will automatically open within the program. Now go to the "File" menu and click on the "Optimize PDF" option. The Optimization pop-up window will appear. From here, you can choose suitable compression settings and preview the result after compression. Finally, click "Save as" to confirm the change. And if you want to learn more PDF solutions, you can visit this page. 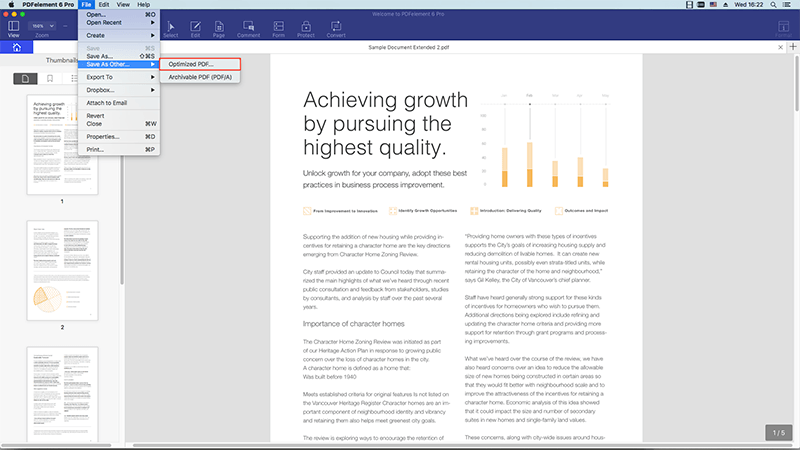 Preview not only allows you to open and view images and PDF files, but also lets you compress PDF files. Below are the steps to do so. Step 1: Launch Preview on your Mac. Step 2: Go to the "File" menu and click the "Open" option. Then then select the PDF file you want to compress. Click "Open" and the file will be opened in Preview. Step 3: Now navigate to the "File" menu again and choose "Save As". In the "Quartz Filter" section, choose the "Reduce File Size" option. You can specify a file name and destination for the compressed PDF. Step 4: Click "Save" to start compressing your PDF file. Method 1: Compress PDF Using Adobe Acrobat "Save As"
Step 1: Launch Adobe Acrobat and click the "Open" option to import the PDF file you want. Step 2: Click "Save As Other…" > "Reduce Size PDF…". And you will open the settings window. 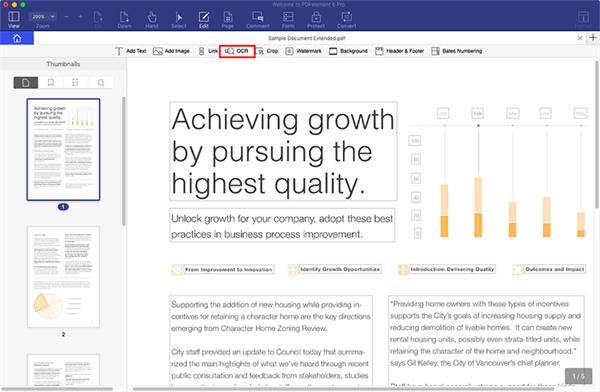 Step 3: Under the Acrobat Version Compatibility tab select newer version, which will reduce the PDF to a smaller size. Step 4: You can click "Apply to Multiple" to apply the settings to multiple files if needed. Step 5: Click "OK" to complete. Step 1: Open Adobe Acrobat and import your PDF file. 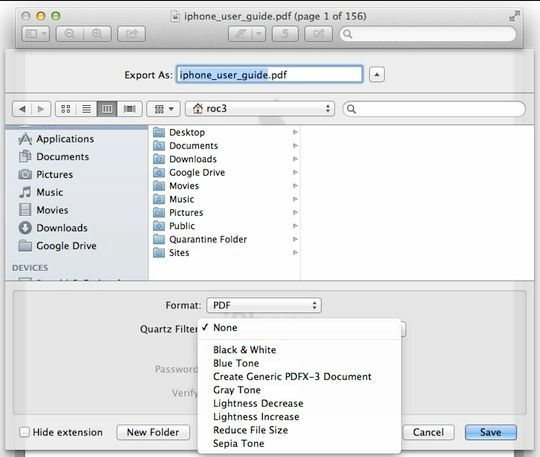 Step 2: Go to "Save AS Other…", and select the option of "Optimized PDF…". Step 3: In the pop-up window, confirm the compression settings. Step 4: Click "OK" to begin the process of making your PDF smaller. There are some other methods to help you reduce PDF file size as well. You can recreate PDF, convert PDF, remove an unwanted object in PDF, shrink images in PDF, or compress PDF using WinRAR. Recreating your PDF is a simple way to decrease its size. By doing this, you can compress images in the file or remove unwanted objects. This method can be complete easily with almost any PDF tool, including PDFelement ProPDFelement Pro. 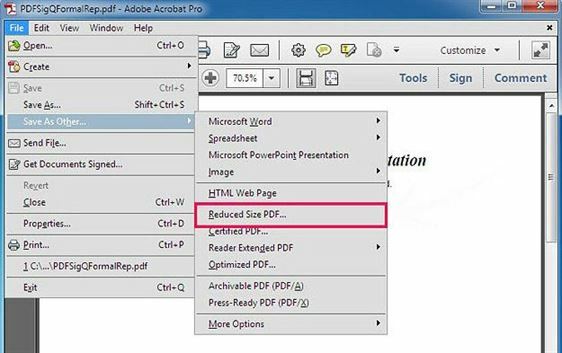 Step 2: Click the "Create PDF" button to open the PDF file with the program. Step 3: Go to "File > Save" to save the file to a new PDF. A PDF file will contain many elements, like annotations, links, bookmarks, form fields and others, which can be removed from your PDF file to reduce the file size. And PDFelement Pro can help you to remove these elements with its built-in editing tools. Step 1: Launch the PDF editor and import your PDF file to the program. Step 2: Click the "Edit" button in the top toolbar. Step 3: Select any element and right-click on it. Then choose "Delete" to remove it. You are also able to condense a PDF file by converting it to other formats like Word, PPT, EPUB, Text file, images and more. PDFelement Pro provides you with multiple output format options when you need to convert your PDF. Step 1: Open the program. Step 2: Click the "Convert" button in the top toolbar to open the conversion interface. Step 3: Click "Add Files" to select the PDFs you want to convert. Then select the output format. You can add multiple PDF files and batch compress PDF on Mac as well. Step 4: Lastly, click "Convert" to start the conversion. WinRAR can help you compress files to a smaller size. If your PDF file is large, you can zip your PDF by using the WinRAR utility. Step 1: Install WinRAR on your computer. Step 2: Find the PDF files you want to compress. Step 3: Right click on the PDF file and select the “compress file” option. Step 4: Select the RAR or Zip option. Then confirm the compression settings and click "OK" to begin the process. You can compress your PDF using WinRAR, but the options are limited. With PDFelement Pro for Mac, you have more options to choose from, including downsample, compression type, and lossless compression. 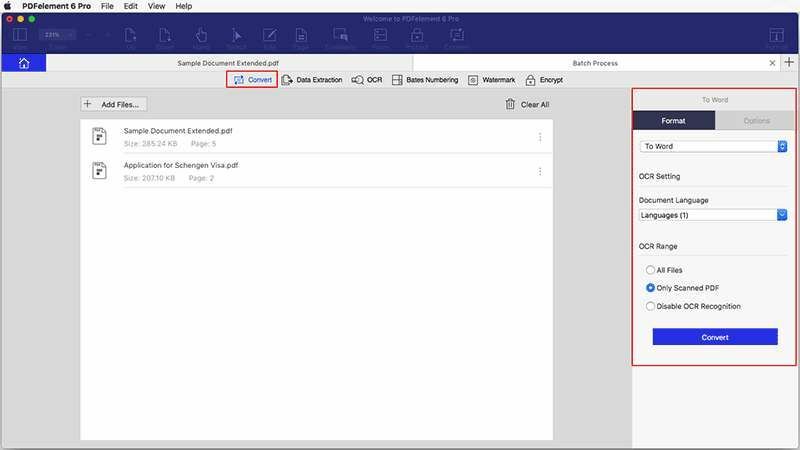 Launch PDFelement and click on the "Open File" button to select a scanned PDF to import into the program. You will get a notification bar asking if you to activate the OCR feature. Go to the "Edit" tab and click the "OCR" button. Select the language you need and click "Perform OCR". The program will start performing OCR immediately. After OCR is complete, you can make any modifications you’d like to the scanned PDF. 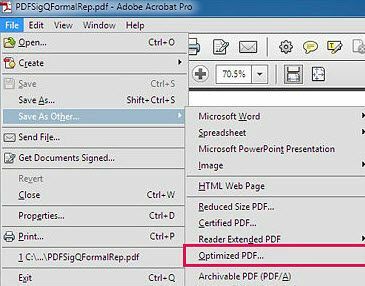 Go to the "File" menu and click the "Optimize PDF" option to start compressing your scanned PDF.